Slavery by Another Name “resets” our national clock with a singular astonishing fact: Slavery in America didn’t end 150 years ago, with Abraham Lincoln’s 1863 Emancipation Proclamation. Based on Douglas A. Blackmon’s Pulitzer Prize-winning book, the film illuminates how in the years following the Civil War, insidious new forms of forced labor emerged in the American South, persisting until the onset of World War II. While to most Americans this is entirely new history, for journalist Blackmon, the film explores a very familiar—and personal—topic. The film, shot on location in both Birmingham and Atlanta, is built on Blackmon’s extensive research, as well as interviews with scholars and experts about this historic period. 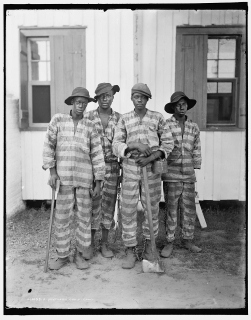 It also incorporates interviews with people living today, including several African American “descendants” of victims of forced labor who discovered their connection to this history after reading Blackmon’s book.